Worked on 14-count perforated paper, this dark blue globe has three sides, each showing a different aspect of a winters night in Bethlehem. The scenes are enclosed in a twinkling circle of snowflakes, and three silver bugle beads hang below the Snowball. 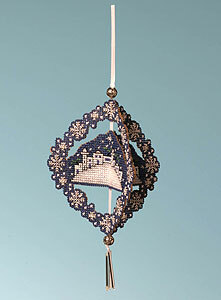 The decoration is threaded with white ribbon and large silver beads, and the finished size is about 17cms long.